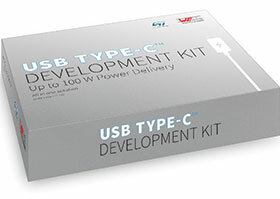 With the USB Type-C development kit from Würth Elektronik eiSos, those looking to take advantage of the expanded range of options offered by USB Type-C and USB Power Delivery (PD) in their projects have a convenient solution at hand. Built from proven USB-Type C technology from STMicroelectronics, the kit is ready for immediate use in prototypes and represents a reference design for safe and flexible USB PD applications up to 100 W.
The USB Type-C connector is today being used by many devices. Whatever the final application is, there are many reasons for adopting USB-C connectors. Since it is reversible, it can be plugged into a device any which way. Able to carry up to 100 W charging power (from 5 V/ 0,1 A up to 20 V/ 5,0 A), it merges and is backward compatible with the functionality of both legacy Type-A and -B ports in a single connector, and even can change roles on the fly. The first board is the 40 W Source Evaluation Board with the STUSB4710 auto-run controller and on-board DC-DC converter from STMicroelectronics. The STUSB4710 integrates all the digital and high-voltage analog circuitry needed to autonomously support full USB PD negotiation. It supports up to five Power Data Objects (PDO) and power-sharing applications thanks to its I²C interface. Typical applications are power-source applications such as AC adapters, power supplies, power hubs, smart plugs and DC-DC applications. The second board is the 100 W Sink Evaluation Board with the STUSB4500 auto-run controller. It allows straightforward migration from STD-B, micro-B or custom power plugs to a Type-C connector. This solution is ideal for automatically prompting a charging process – even if the battery is empty. The STUSB4500 supports up to three PDOs. Typical applications are electronic devices charged through a USB Type-C connector. The third board is the 100 W Source Demo Board with the STUSB1602 – an analog front-end that is a companion chip of the STM32 microcontroller – and on-board DC-DC converter. The STUSB1602 provides up to 5 PDOs. Typical applications include power-source applications such as AC adapters, power supplies, power hubs, smart plugs and DC-DC applications.